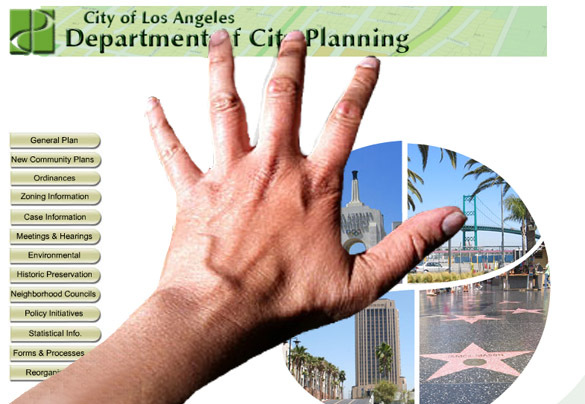 Raising the question of why the city of L.A. needs a planning department and planning commission, a city council committee Tuesday rejected planners’ recommendations and a unanimous commission vote by approving massive amounts of “architectural” lighting and advertising signage for downtown’s billion-dollar Wilshire Grand development project. Two members of the Planning and Land Use Management (PLUM) committee, chairman Ed Reyes and member Paul Krekorian, voted with little discussion to give the go-ahead to a sign district allowing advertising signage greatly exceeding the amount recommended by the planning department. The PLUM committee also gave its stamp of approval to colored, changing lighting built into the facades of two high-rise towers, even though the planning commission voted not to allow it. The City Council is scheduled to vote on the project at its March 9 meeting. While anything other than unanimous approval would be a surprise, the timing is in question, since planning commissioners may be expecting changes in the sign district to return to them for discussion before a final vote is taken by the City Council. At a meeting last December, the commission approved a sign district for the project that would replace the existing Wilshire Grand Hotel with a 45-story hotel tower and 65-story office and condominium tower above street-level shops, restaurants and other retail establishments. The developers had originally proposed nearly 250,000 sq. ft. of electronic advertising signage, including “Blade Runner” style ads on the facades of the towers, but the commission accepted the planning department’s recommendation that greatly scaled back that signage. The planning department recommended allowing architectural-lighting without advertising on the towers, but the commission voted against it, citing the fact that no one had adequately demonstrated how the lighting that could fundamentally change the city’s skyline would actually look. Mitch Menzer, a lobbyist representing the project developers, Hanjin International and Thomas Properties Group, strenuously objected, saying that having to return to the commission would defeat the purpose of maintaining a schedule. Menzer hadn’t argued earlier against the planning department’s recommendations, or disputed a city planner’s statement that consensus had been reached with developers on the signage details, referring instead to “fine tunings of legality” that could simply be approved by the city planning director according to a “standing delegation” of authority. Despite leaving the impression that they would not seek major changes to the sign district approved by the planning commission, the developers appealed to the City Council, seeking to greatly increase the amount of advertising signage, and restore the architectural lighting on the towers. The developers also sought approval of an unlimited number of supergraphic signs up to 300 sq. ft. in size, although the planning department recommended against these as well. The PLUM committee first took up the appeal on Feb. 22, but after more than hour of public testimony final action was put off until this week’s meeting. At both meetings, City Councilwoman Jan Perry spoke at length, urging Krekorian and Reyes to approve the tower lighting and the signage sought by the developers’ appeal. She argued that the increase in signage over the amount recommended by city planners would “maintain the architectural integrity” of the project’s design and contribute to a “dynamic” atmosphere for that part of downtown. City Planner Kevin Keller said that department recommendations had been “carefully considered” to address potential problems of light trespass on nearby office and residential properties, and to ensure that almost none of the electronic advertising would be visible from the heavily-traveled Harbor freeway less than half a block away. In a brief discussion prior to voting, neither Reyes nor Krekorian had anything to say about the big disparity in the planning department’s recommendation and the amount of electronic signage sought by the developers. Issues raised by the planning commission about the lighting on the towers also went undiscussed by the two committee members. At the initial PLUM committee meeting, Krekorian had spoken in favor of delaying a decision, saying that “We’ve had a lot of questions raised, we’ve had a lot of material submitted to us very recently…” Apparently, those questions were answered and material digested in the past week, although the public wasn’t privy to the any of the councilman’s thinking on the matters. The third member of the PLUM committee, Jose Huizar, failed to show up at either committee meeting. No explanations were given for his absence.